It’s one thing for a big film to be fueled by big spending and another thing altogether if its only intention is to rake in money. Inferno lands with a thud into the latter category. This is one of Hollywood’s worst franchises – getting more and more miserable each time around – and has a billing made up of all the things crime / murder mysteries should run away from. 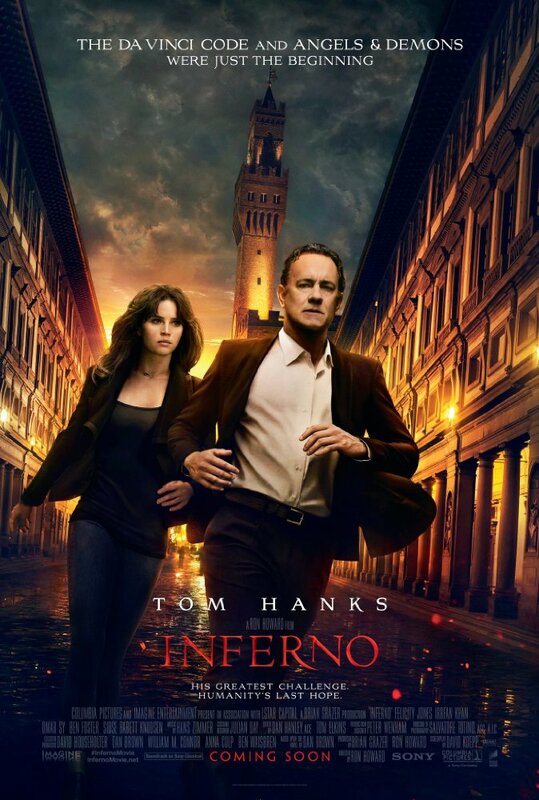 I’m comfortable calling Inferno one of the dumbest movies I have seen this year, and this picture’s bar is so low that instead of limboing under its massive weight to find answers it just hops over the lines of questioning altogether. Few things are as frustrating as an imbecile trying to act intelligent. 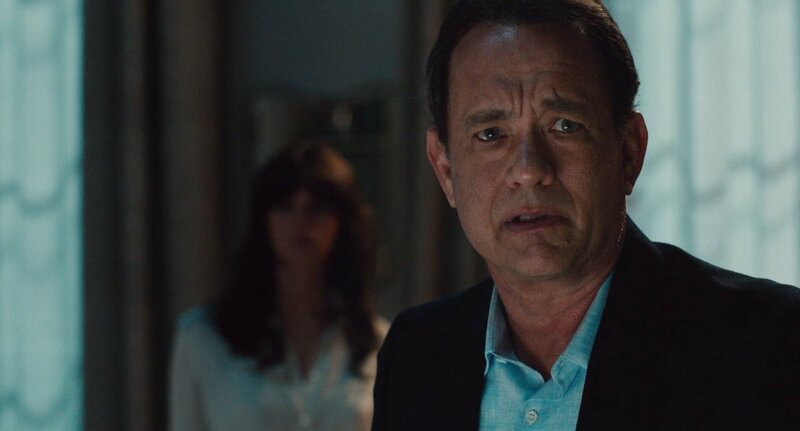 Robert Langdon (Tom Hanks) awakens in a hospital bed, head ringing, vision fuzzy. Sienna Brooks (Felicity Jones) is his doctor, telling the professor that he’s sustained a head wound. Then a woman comes to kill them, they escape, and the two join forces to solve a puzzle. 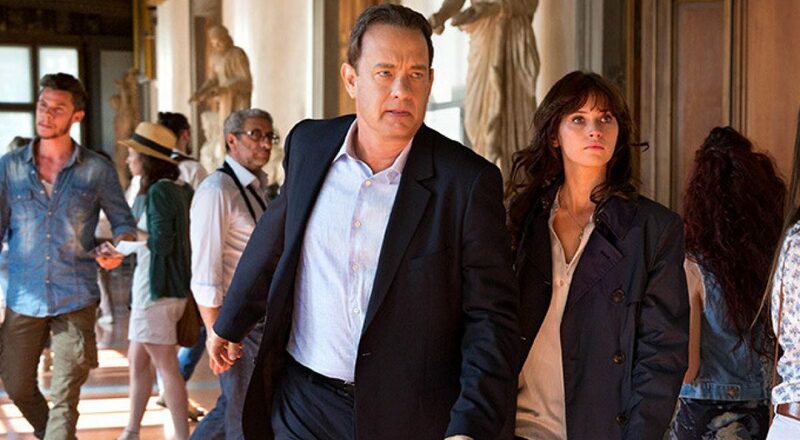 There’s plenty more to Inferno’s plot. Omar Sy plays an untrustworthy World Health Organization agent, Irrfan Khan runs a private security firm, and Ben Foster is billionaire geneticist Bertrand Zobrist. As the film’s antagonist, Zobrist has created a plague to wipe out countless civilians. Overpopulation is a real threat to our species and sustainability doesn’t seem feasible. He’s the bad guy so we’re supposed to root against him, but despite his malicious intentions, Zobrist is the film’s only reasonable, smart, and sympathetic character. Ron Howard travels all over the map with his off the wall film, from Florence to Venice to Istanbul in search of the virus. This is a pretty movie, at least aesthetically speaking, packed with pretty damn fine actors, none of whom really seem devoted to becoming these people outside of Foster (whose total screen time has to register under 10 minutes). It’s even difficult to enjoy Mr. Hanks here. Langdon spends the entire film suffering from temporary memory loss, forgetting what coffee is but still managing to rattle off facts about Botticelli’s Map of Hell. While the script points out this ridiculous tidbit, it nevertheless indicates further sheer idiocy in every action and exchange of dialogue. If you want a wildly entertaining and fuzzy crime thriller, check out the 2003 Belgium film The Memory of a Killer instead of this parakeet of a magpie. Inferno and this entire series is desperately missing a sense of fun. 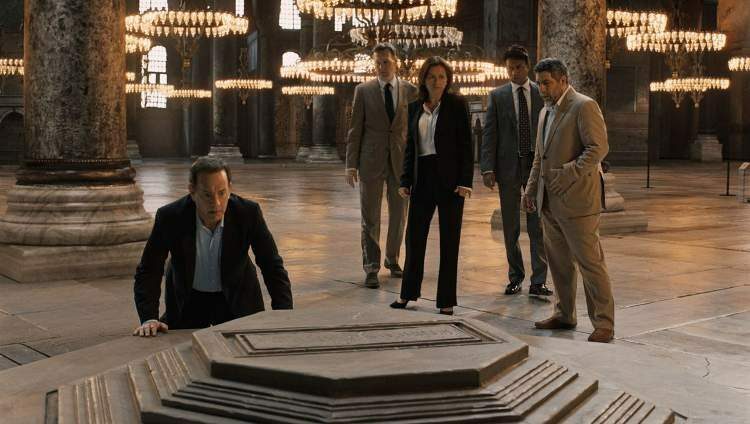 These movies are utterly preposterous and make zero sense, likening themselves more to the National Treasure franchise than the aim for Sherlock investigative techniques with a tourist twist. However, there’s no adventure implicitly built into the story besides a traveling sense of voyeurism with an oft stamped passport. We don’t get Nicolas Cage delivering one of his patently cheesy lines, nor are we left with any Dickensian cliffhangers to throttle up the mystery and hold us on edge. National Treasure knows that it is inferior material on the page but doesn’t have a superiority complex holding it back in its translation to the screen. Conversely, Howard telegraphs and conducts the picture to the point of inaction. It’s been a long while since I’ve seen such a disastrous and brainless disaster movie. Inferno’s fire burns as true as a Duraflame log.